15-year old Aaron Ye 7d (at left) defeated Muzhen (Alan) Ai 7d (right) 2-0 to claim his fifth Redmond Cup title, making him the third Redmond Meijin (following Eric Lui 1p in 2001 and Curtis Tang 8d in 2010). Ai put up a good fight throughout the match, having held a large territorial lead for most of Game 1 until a decisive mistake in the endgame gave Ye the opportunity to just barely reverse the game and win by 1.5. 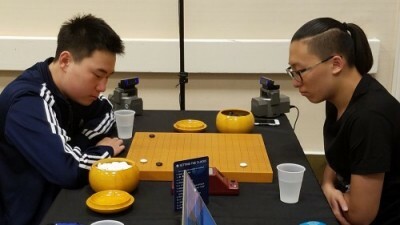 Determined to cement his title in Game 2, Ye played a solid game, establishing an early territorial advantage and holding it until Ai was forced to resign after miscalculating the life and death of one of Ye’s groups. Ye has been a dominant force in the Redmond Cup ever since he started playing in it at the age of 9, winning the Junior Division four times in a row from 2011-2014. While the competition grew tougher once he aged into the Senior Division (13-17), Ye has remained at the top of the North American youth scene.